It was a pretty good first contest, here at Gravediggers Local 16. Before we go any further, we want to extend our gratitude to all of those who entered. A contest without entries is the saddest pumpkin on the block. You took time out of your day to craft together some effort – could have taken an hour or a minute – it was still time that you gave to this little website. Thank You. We have received word back from our celebrity judges, the Freakshow Family – Bernie, Loretta and daughter, Poinsettia. We’ve tallied up the scores and are ready to present the winners of the 2010 Halloween Contest here at Gravediggers Local 16. We received a wide range of limericks, offering our judges the chance to puzzle at the clever wordplay offered by you, our readers. It came down to Mike‘s entry that won the Grand Prize – a copy of Halloween Hootenanny on CD, a Bath O’Lantern organic vegan soap from BubbleGenius, a membership to ZombiePumpkins.com and, in addition, he will receive a pumpkin themed metal Luminary that Weird Jon has donated from his wild traverses across this haunted globe. Got caught sniffing somebody’s stocking. The runner up prize goes to Ellen Hudson, who vividly captured one of Weird Jon’s best kept secrets – his lifelike animal calls. How she knew, we’ll have to leave to private eyes and mystic mediums. But her clairvoyance and witty writing will earn her a copy of Halloween Hootenanny on CD. The Gravedigger’s Local was in for a scare. Weird Jon would arrive dressed as a bear. Making guests run for the door. Leaving the gravediggers alone in their lair. Congratulations to the winners of the Limerick Contest! Not for nothing, everyone who submitted demonstrated a clever grip on rhyme, and we would like to share all the entries with you! Jump out of the shadows and give Gdl16 and his Followers a fright!!!!!!! Scare the crap outa me!!!!! Biting necks he declared, I might like that. Two gents called Burke and Hare. A fresh corpse theyd bring to the air. About wanting to know what we’re thinking. That someone’s slipped arsenic in it! And all of the guests went a zooming. Weird Jon had a coffin full of cash. To buy music to make sure the party was a smash. But the hit of the night was the Monster Mash. And he walked the local’s halls handing out candy. Zombies looking for brains, could this party supply anymore? We’ll have to use their guts and make something arty! at the lad looking smug & quite vain. He was looked on as something to drain. On Halloween night someone spiked the punch. Atomic Mystery Monster lost his lunch. Drink up the punch, was my first hunch. Even Strange Jason got a date. But Jason was sure he found his mate. It was a close contest here. With a narrower field of entrants, it came down to a hair – one of Bernie’s – in deciding who would walk away with the grand prize. But it was Ellen Hudson, whose uncanny ability to capture the Atomic Mystery Monster in art form – something photographers have failed to do for decades – won her the Grand Prize of Scarecrow brand custom fitting vampire fangs, the high end Blood Gel to go with the new fangs, Perfect Creature on DVD and Heart On anatomical heart-shaped vegan soap from Bubble Genius. As for the Runner Up in the Art Contest, when we said it was close, it was. In fact, all three other entrants, Cheryl Dmetruk, Mike Roberts and Miss Wendy Thirteen will all receive a copy of Perfect Creature on DVD because the contest was that close. Bernie, Loretta and Poinsettia all had their favorites in the other pictures and instead of causing a family feud that might render our favorite freakshow family asunder, it just made sense to reward all entrants on their great submissions! 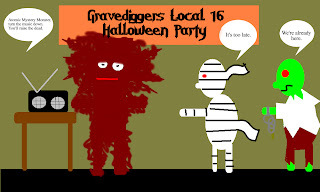 And with that, the Gravediggers Local 16 2010 Halloween Contest comes to a close. With one week left until the big night, we hope that all of you have a blast getting ready for a great holiday. Thank you again to each and everyone of you who entered. Thanks to the Freakshow family for helping out with judging this year’s contest. And thanks to you, dear readers, patrons and union members. We wouldn’t be here without you. My thought? Which witch was which?